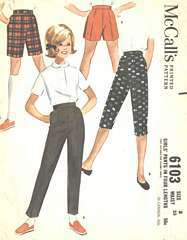 Vintage McCall's sewing pattern 6103. Pants with elasticized back waistline in four lengths. All have left zipper, pocket in right side seams. Shorts have carriers for purchased belt. Long pants and below-knee pants have vents in side seams. Girls' Size 8; Waist 23. Pattern is cut and complete. Envelope is very aged with wear and tear to edges.